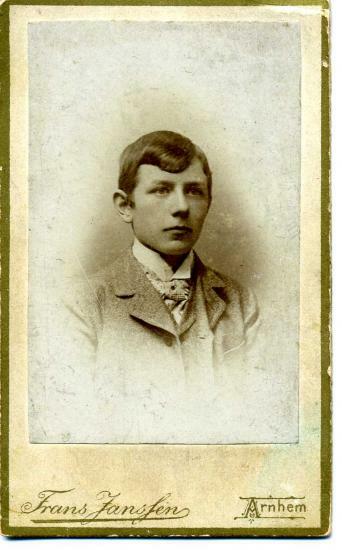 # Lodewijk Gerardus Paulinus ten Wolde (callname : Louis) , portrayed here in around 1905 , was the second child of Maria Petronella Arnold and Albertus Paulus Wilhelmus ten Wolde , my great-grandparents . Louis was born on October 9th 1883 in the city of The Hague in the Netherlands . We fear that Louis didn't enjoy a happy and care-free childhood . The marriage of his parents might have been bad , possibly even disastrous , right from the beginning even . The marriage of his parents ended (and this was quite remarkable for a marriage in those days ) in divorce , when Louis just was a boy of 10 years of age . 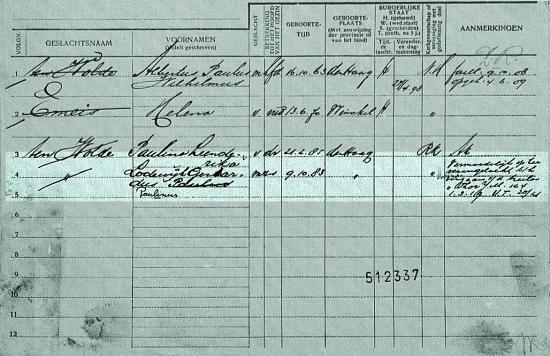 By the end of the 19th century Louis , together with his mother and younger sister Lena (my grandmother) , moved from The Hague to the city of Arnhem in the province of Gelderland , the place where Louis' mother had been born and raised and had been living before her (dreadful) marriage . One day , in the summer of the year 1901 , mother Maria Petronella Arnold became so terribly sick , just after a trip she had made with the Van Pallandt-family to France , that the consulted doctor wasn't able to save her life anymore ....... But with medical standards of our days her life probaly could have been saved rather easily . My great-grandmother died that summer on July 25 at the still young age of 41 . Our gambling man Ligtvoet earned his living in those days (which he seemed to have been gambling away rather frequently...) as a deep-water seaman . For whatever reason Ligtvoet decided to stay ashore for a longer period of time than he was used to , and he found Louis ten Wolde (who was on long furlough from the Dutch Indies in those days) prepared to take his place as a seaman on a ship bound for America . Ligtvoet just might have been very lucky at gambling (for a change ...) , which allowed him to stay ashore for a while - we also do not know for sure what could have been the reason or reasons for Louis ten Wolde to do so . Was Louis perhaps in such a desperate need of money or was Holland already getting a little bit too oppressive for him ??? When the news of the tragedy with the ship also reached the mainland , one could expect that Ligtvoet's wife (so the wife of the man who had so miraculously escaped certain death , one might say) , would have been very releaved that her husband hadn't been on board of the ship , but nóthing of the kind ....! Shortly after having received the news about the disaster Ligtvoet's wife went to the nearby house of Lena ten Wolde , sister of Louis , who still must have been mourning over the sudden and cruel loss of her only brother . The life of Lodewijk Gerardus Paulinus ten Wolde , born on the ninth of October in the year 1883 in the city of The Hague , had suddenly and cruely come to its final end in or around the year 1919 somewhere on the North Sea or possibly somewhere on the Atlantic Ocean , hundreds or even thousands of miles from home - Louis still was an unmarried man then and he can't have been much older than 36 years at the time of his death .